Apache Tomcat is a web server and servlet container that is used to serve Java applications. Tomcat is an open source implementation of the Java Servlet and JavaServer Pages technologies, released by the Apache Software Foundation. 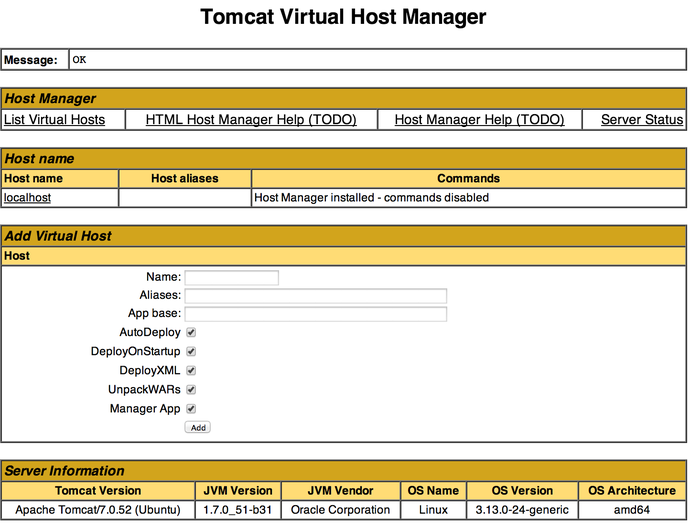 This tutorial covers the basic installation and some configuration of Tomcat 7 on your Ubuntu 14.04 server. Note: Tomcat can be installed automatically on your Droplet by adding this script to its User Data when launching it. Check out this tutorial to learn more about Droplet User Data. Download the binary distribution from the Apache Tomcat site. This guide does not cover this method; refer to Apache Tomcat Documentation for instructions. For this tutorial, we will use the simplest method: apt-get. Please note that this will install the latest release of Tomcat that is in the official Ubuntu repositories, which may or may not be the latest release of Tomcat. If you want to guarantee that you are installing the latest version of Tomcat, you can always download the latest binary distribution. Before you begin with this guide, you should have a separate, non-root user account set up on your server. You can learn how to do this by completing steps 1-4 in the initial server setup for Ubuntu 14.04. We will be using the demo user created here for the rest of this tutorial. Answer yes at the prompt to install tomcat. 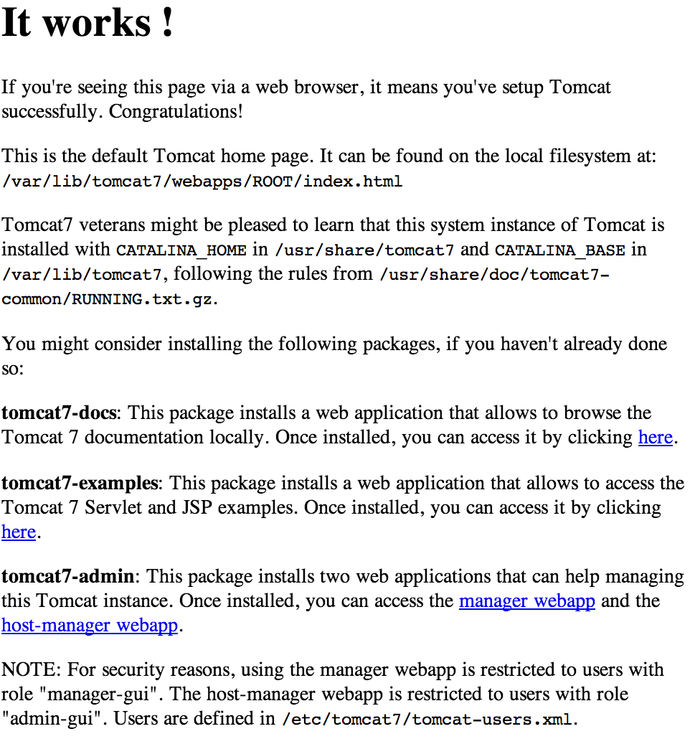 This will install Tomcat and its dependencies, such as Java, and it will also create the tomcat7 user. It also starts Tomcat with its default settings. You will see a splash page that says "It works! ", in addition to other information. Now we will go deeper into the installation of Tomcat. Note: This section is not necessary if you are already familiar with Tomcat and you do not need to use the web management interface, documentation, or examples. If you are just getting into Tomcat for the first time, please continue. Answer yes at the prompt to install these packages. We will get into the usage and configuration of these tools in a later section. Next, we will install the Java Development Kit. If you are planning on developing apps on this server, you will want to be sure to install the software in this section. For more information about Apache Ant, refer to the official manual. For a tutorial on using git, refer to DigitalCloud's Git Tutorial. 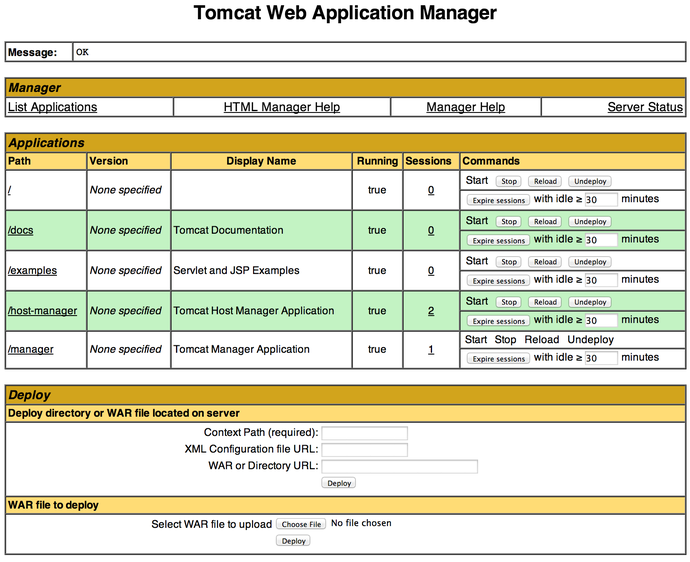 tomcat7-admin (manager-webapp): Tomcat Web Application Manager. This will allow you to manage and your Java applications. From the Virtual Host Manager page, you can add virtual hosts to serve your applications in. Your installation of Tomcat is complete! Your are now free to deploy your own webapps!